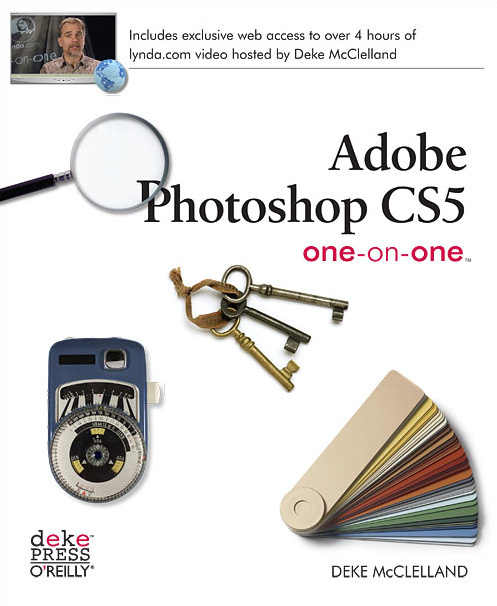 Abobe Photoshop CS5 One-on-One is a great book for Photoshop CS5 users. As with many tutorial books, it takes you from the basic chapters on cropping and resizing an image, to layers and more advanced features. The first chapter is dedicated to opening and organizing pictures with Bridge CS5, while the last one is on traditional printing and export to web functions of the software. Many aspects of the tools in Photoshop CS5 are presented in the book. Making selections, an important part of the Photoshop workflow, takes an entire chapter. Almost at the end, a tutorial shows how to make a complex selection using the Channels from the picture. The author will teach you many fundamentals of Photoshop, namely retouching, healing and enhancing a picture as well as adjusting color and removing color cast. As you read and follow the book, the author also reaches some more advanced features of Photoshop CS5, such as Smart Objects and Smart Filters. It also covers features such as Free Transform, Adobe Camera Raw and masks. Some parts of the book teach you compositing and how to work with text layers. The book is specifically named with the CS5 version of the software. But most of the chapters will be doable only with CS4 or even earlier versions of Photoshop. When a new feature of CS5 is mentioned, it is clearly stated and users of previous versions can skip this section easily if they want. There is no specific section on Photoshop CS5 new features only. But it is well integrated in the flow of the book. The book does not come with a CD-ROM, but online contents can be found from the provided link in the book. The content includes both the material used in the tutorials, as well as small video clips at the beginning of each chapter. According to the book cover, there are five hours of video. The book Adobe Photoshop CS5 One-on-One is nice reading. It does not have a specific goal in mind, but can be seen as a typical introduction to Photoshop book. The book is written for both Mac and PC, telling you specific shortcuts for each platform. It is very comprehensive and includes lots of material for beginner to intermediate users.